As an England fan, it's sad to see them leave the tournament so early. Hopefully they'll put on a good show in their last match against Costa Rica. I've done the Pimm's Cup, a beer, what's next? I can't finish on a good old cup of tea. Another English classic though is cider. 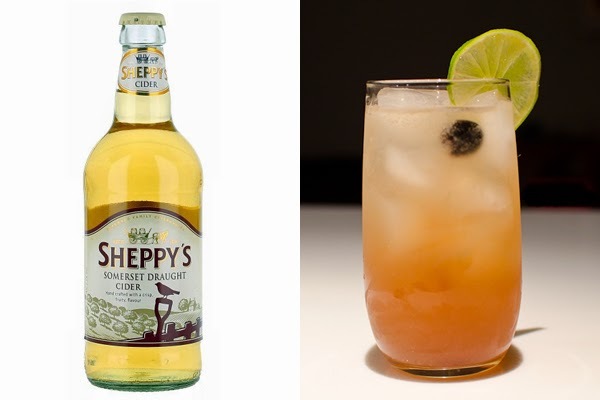 Sheppy's Farmhouse Cider is from Taunton in Somerset, which is a traditional cider making county. Their Somerset Draught Cider is a dry, crisp, fruit cider. It can be a perfect pairing for cheese. In this case, I'm thinking a hunk of English cheddar. I've been on a rum kick of late and Ron Centenario is from Costa Rica. The eastern edge of Costa Rica is on the Caribbean Sea, so rum from Costa Rica is not that crazy of an idea. The Planter's Punch comes to mind, which is made with dark rum, lime juice, and grenadine syrup and a splash of soda water, then garnished with an orange slice, lime slice and a maraschino cherry.